One of Andrew Phelps’s most powerful subjects in his new book, Haboob, is Nothing. 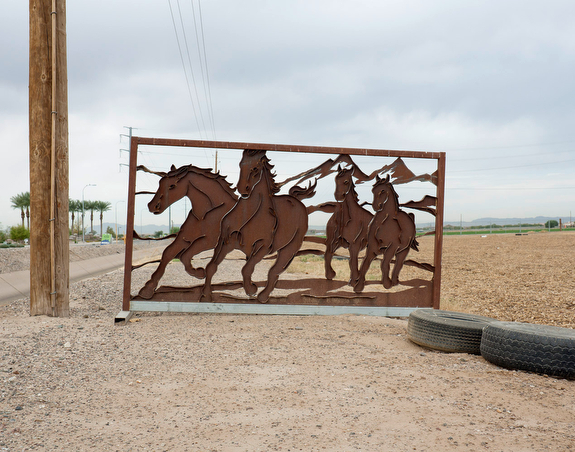 Haboob documents the effect of the economic downturn on Phelps’s hometown of Higley, Arizona. The book’s title is the Arabic name for the seasonal desert winds that sweep through the region. One of the Nothing photos shows the wonderfully-named intersection of Buckaroo Trail and Liberty Lane. The sign for Liberty Lane is slightly bent. The remarkable thing about the intersection is that there are no houses or buildings of any kind there. In the distance, we see upscale homes, but at Buckaroo and Liberty there’s nothing. Another Nothing photograph seems to riff on Ansel Adams’s famous shot of a moonrise in Hernandez, New Mexico. Adams filled the middle ground with a small church and gravestones — signs of the life and death of a community. But Phelps’s moon rises over nothing — a pole and road sign in the foreground, bare desert stretching through the middle ground, toward a tiny distant line of green. Many of Phelps’s photos document loss: a ruined palm tree, a fountain sitting in the middle of a large field of gravel. Other pictures show confusion: paint color swatches scattered on the ground, iron mustangs on a gate to nowhere, church signs and political signs in a desolate stretch of road. Haboob is a beautiful and grim meditation on emptiness and destruction. The book is published by Kehrer Verlag.